Fab set of speaker, wonderful sound stage and Dynamics excellent top end, deep base for the size of the cabinet, I highly recommend these speakers, I can't speak highly of them. Bass for size, detail and imaging, big soundstage. I bought a pair of RS1's first for my main speakers after auditioning them against the bronze 2's. The S1's are unbeatable at full price and at the current discounted pricing a no brainer. I love them. 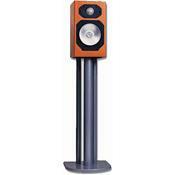 I sold off a pair of $1000 Whafedale towers , the S1's sounded better in every respect. Crisp and accurate in bass and tone. The layering is good. The Monitor Audio S1 vs the B2. I sold off my B2 and bought the S1. This was because listening to the S1, which I instantly decided to remove the B2 from my speaker stands. The S1 sounds crisp and accurate. The layering and detail from these speakers are simply superb. Even the bass are tight and well defined Sorry B2, S1 burns you off. As a bach-fanatic and jazz-enthousiast, I wanted to upgrade my speakers. I used to have a pair of JAMO SL95 disco-beat-pumpers. I listened to the famous QUAD 11L, and this one (Monitor Audio S1). They are about the same size and price. When it comes to rhytmic music (Stevie Wonders Superstition), the 11L is unbeatable. But putting on a peace of classical music with a lot of layers in the music, the S1 kills the 11L. The S1 pulls the music into a superb soundstage that reaches from the ceiling to the carpet. Vocals (like Norah Jones) are crispy clean. Jazzy drums are tight and clean. Solo-instruments are like sitting in front of them. From cello to hobo, it's an enjoyable sound, and very realistic. The bass is astounding deep for a little speaker like this one (30x17,5x24 cm). It likes to be near a wall for greater bass-reflection. Don't putt on a cabinet. It will get to boomy. It needs a long time to play in. The booklet says 60 hours, but I noticed up to 100 hours of playing-in-time. Bi-wired the speakers after playing in, and noticed quite a big difference. If you're looking for a little speaker for classical or jazz, try these little wonders.